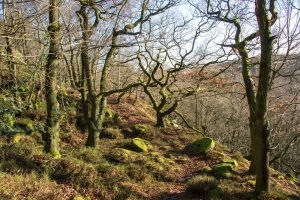 Ancient oak woodland is one of the glories of the English countryside and Baslow has a small share, up under the Edges that dominate the village. The ancient woodland on the edge of Baslow is under Blackstone Edge, which you can see on the left as you drive out of Baslow on the Sheffield road. The trees in the photographs could well have been saplings when the quarries closed 300-400 years ago. All that remains of the former quarries are the two millstones, which can be seen in the adjacent photograph, that were never finished and have remained where they were left ever since.